The topic of home ownership for military families is a hot one. I absolutely agree that there are many reasons that a military family may want to buy a house: the pleasure of being able to do whatever you want to the house, the guarantee that you won’t have to move mid-tour, the difficulty in finding a place that will accept certain pets, even the possibility that you might make some money. 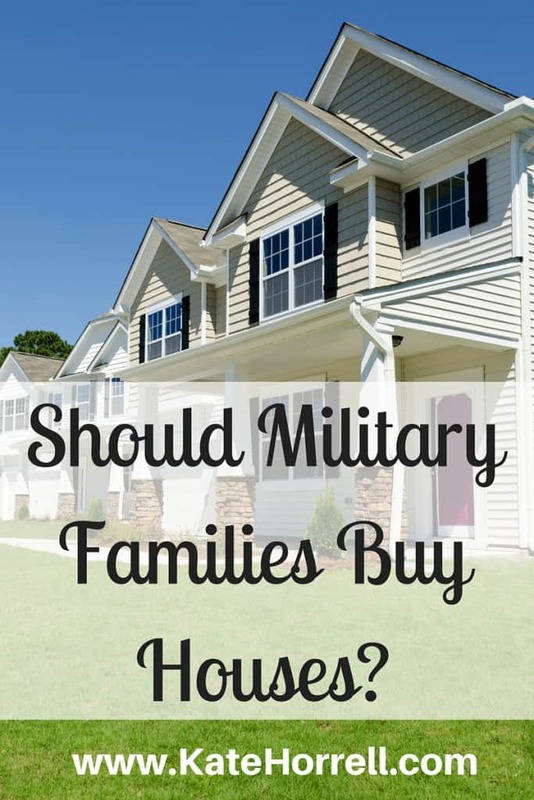 It is a lot less clear whether buying a house makes financial sense for a military family. Let’s take a relatively generic hypothetical scenario and see how the numbers play out. Purchase Costs: Seller agrees to pay half, so perhaps $4,000. Payment: Principal and Interest at $907 per month, plus taxes $120 per month, plus insurance $80 per month, for a total mortgage payment of $1107 per month. Let’s assume that this family is stationed at this location for three years. For those three years, they’re paying $1107 a month in mortgage payments, plus whatever maintenance and repairs are required during those three years. Over a three year tour, the family will have paid $39,852 in mortgage payments and $12,000 in maintenance, for a total cost of $51,852. This same house rents for $1300. Over three years, the family would have paid $46,800 in rent for the same property. Therefore, owning is costing them an additional $5,052 more than renting over three years. At the end of the three years, the family has orders to move somewhere else. They decide that they’re not mentally cut out to be landlords, and so they sell their property. They’ve been lucky and the market has gone up a bit, so they’re able to sell for $205,000. Of course, there are some costs to selling. They’re using a discount broker, so they’re only paying 4% in commissions, which is $8,200. They’ve agree to split the closing costs with the buyer, costing them about $4,000, so they’ll only receive $194,850 net proceeds from the purchase. After 36 months of payments, their mortgage has a balance of $179,548. After paying off the mortgage, the family will walk away from the experience with $13,252. That sounds great, until you consider that they spent $14,000 at the purchase, including the $10,000 down payment and $4,000 in closing costs. They’re actually coming out with $748 less than they had at the beginning of the story, plus they’ve spent $5,052 more in holding costs vs. renting, for a total of $5,800 more spent by buying. Keep in mind, this rundown is a pretty “best case” scenario. The family is able to get the sellers to pay half of their already low closing costs. They’re not paying any crazy points for their loan. They don’t have any large maintenance emergencies during the time they own their house, just typical stuff. They get a decent, not great but not terrible, interest rate of 4% on their mortgage. Their house is not in a flood plain, so they are not required to maintain flood insurance. (They probably should, but that’s another article entirely.) The house appreciates in the three years that they own. They sell with a discount broker. The buyers are only asking them to pay half of the closing costs for the sale. Even getting a reasonable break on each aspect of the transaction, this family is still losing money on their home ownership experience. I’ve run a number of different scenarios, and this family needs to have several factors align in their favor before the math supports buying. You can see the calculations here. I’m going to continue to add to them, playing with different markets and other variables. Now, there are many reasons why you might want to buy even if it is going to cost a little bit more. For me, it is important that we not change schools during a tour. My husband enjoys being able to bang around in his own house. Pet owners sometimes have challenges finding rentals, and some people just really want to decorate. For these and many other situation, buying might be right even if the math doesn’t say so. The important thing is not to assume that buying is always right, and look at the situation critically before using money as one of the decision-making issues. We know a lot of families that did this very thing…seems legit until it’s not. Not as clear cut and dry of a path to come out on top in military areas -when everyone else is trying to do the same thing. Thanks for the article. 1. Renting your home: You can rent your home if the markets are unfavorable or you can’t find a buyer in a timely fashion. Renting involves additional work, but additional rewards. You still build equity and get additional tax benefits as a business and depreciation costs. You can also continue to list the property for sale while renting, but this is a burden for the renter and you need to discuss this before you do. 2.Federal and State Taxes: You get a nice break on federal (and state) taxes for mortgage interest/points when you itemize. Also, if renting, business expenses and depreciation. Not to mention that if you sell your rental property at a loss, it is tax deductible. 3. Maintenance: Maintenance/repair costs can vary wildly. I love “Most analyses have determined,” what analyses? No reference information is given. Based upon this article’s estimates, a home warranty with several repair calls is cheaper! What about repairs done by the homeowner? They are significantly cheaper and don’t forget the military discounts from home improvement stores. 4. Buying/Selling a home: You don’t always need a real estate agent; you can rent/sell your home without one. If you do use a realtor, you may get a discount/bonus through military buying programs. You can also negotiate their commission. Everything is negotiable, and paying “half” of closing costs is simply too simple! Based upon the state, there are certain costs paid by the seller/buyer and others are negotiable. And in rare situations you can even have some costs covered by the lender. 5. Loans/credit scores: VA and FHA and other home loans may allow loans with no money down. Rates can be negotiated. Many credit unions/banks can match Good Faith Estimate (GFE) offers and even offer bonuses! The GFE is important because it is a federal form and legally binding, That means their estimates of some items have to be in range and if not, they are liable for the difference in cost. Oh, and some state veterans boards offer veterans, active duty, even reserve or national guard special interest rates and easy to qualify loans. Don’t forget you can pay off the mortgage faster by applying additional principle, thus decreasing the amount of interest paid over the life of the loan and increasing equity. 6. Renting a home/Base housing: Less responsibility, less risk, more flexibility; and this is fine, but it does not help you build wealth. If you rent below your BAH, then you can use those savings for other things, like utilities, future down payment or investments. That is pretty much the only scenario where I could see a potential benefit; usually that is not the case. BAH is completely forfeit if you live on base, no matter if the accommodations are better/worse than what you could afford. You may also have to PAY for “damages” and other expenses when leaving a rental home/base housing. Oh, I could go on…but from my experience, military people that own a home(s) are financially better off (Not all, of course). Those that did not purchase a home end up regretting it when they get out or retire. They find that they have no equity, sometimes average or unfavorable credit scores and less in retirement savings (of course these are generalizations!). Why? Well, in one word, discipline. When you don’t have to pay a mortgage, are they paying themselves, can they afford to? Their BAH went to military housing or a landlord. It did not help them build any equity. It did not reflect favorably on their credit reports. This is more like a below-average to average case scenario, in my opinion. Owning a home isn’t for everyone, but is NOT indicative of what you have calculated on your website. Michelle – I appreciate your comments. You bring up excellent points, though not all of them are completely accurate. For example, the mortgage interest deduction disporportionately benefits higher income families who buyer larger houses. “The July 2011 Reason Foundation study, “Unmasking the Mortgage Interest Deduction,” found that the annual average tax saving of the mortgage deduction for a taxpayer making $50,000 to $75,000 was $179.” http://www.bankrate.com/finance/taxes/tax-loopholes-mainly-benefit-rich-1.aspx $179 a year is not a valid arguement for homeownership. I remember getting a shocked phone call from my sister when she bought her first house. Because she owns a less-expensive house, she gets no tax benefit from homeownership. This is true for many military families. While you feel that I have presented a “below-average to average case scenario,” I believe that you are presenting only positive facts. When I wrote these scenarios, I honestly didn’t expect the math to come out SO FAR against home buying. That is why I continued to adjust variables, in hopes of finding a positive outcome. As you can see, you’ve got to get a lot of positive factors together to make short-term homeownership a financially smart choice. I am glad that you have had good luck with home ownership, as have I, but I talk to many, many military families who wish they had never bought. Every day, military families are facing short-sales, foreclosures, or wiping out their savings to support a house that they couldn’t “afford” in the first place. It pains me to see so many families sacrificing their overall financial future because some well-intentioned person convinced them that they should buy a house. Had renters 5 years ( we had to pay about $50 per month out of pocket since we used a management company. We were stationed overseas so it was something we had to pay to make sure someone is “taking care of the the house and watching over.) The tax benefits were good. Now we come to that “fun” part when things got bad… The people who were renting the house asked if they could extend the lease till September 30th ( this was April 2016). We said no, you can move out June/ July or sign a one year lease ( there is no rental traffic or very little in that area in October). So they signed a one year lease, come on September they give a notice and leave anyway. We were trying to or sell and nothing not enough traffic to get the house rented or sold! We were paying rent and mortgage for 9 months!!! Now we are in court ( people who rented our house were not military). I have friends who have had great luck with their rentals ( it really is a game of luck) and friends whose houses have gotten trashed, friends who all of sudden did not get the rent payments and the people still living in the house. I think your article was honest and gives a good advice to people who are thinking about buying a home. We might buy a home if we get stationed to the right area ( like D.C) but never again in a military town. Kate, Thanks for the great article. I wanted to ask if you think this analysis changes based on how long you know you will be living at the duty station. For instance if the orders are for 6 years, does that increase your chances of getting a return on investment? Timeline is a big factor. Unless you are in a super-lucky situation where it is customary for the sellers to pay costs when you’re the buyer, and then it flips to the buyers paying costs when you are the seller, the costs of buying and selling can be quite high. Our last purchase, our closing costs were almost $10,000 (and the seller was paying the agents another $24,000.) The more years you can spread these costs, the more likely you’ll be profitable. Very interesting but I feel you showed the very conservative side. For example, the 210,000 house my parent bought in 2013 rents for 1650 a month. The hubs and I have bought 8 houses and they have been beyond financially beneficial for our family. The $165,000 house we bought with the hubs VA loan rents for 1425 and our mortgage was $950. I did an entire post with actual numbers ( http://www.reluctantlandlord.net/case-study-renting-vs-buying/ ) because buying for even a short period has been hugely beneficial for us. Even with replacing a bathroom and a new ac unit and intsalling a filter. Totally not for everyone, but wanted to share a more liberal but still very succesful story. I will continue to be thrilled that it is working out for you, while still strongly believing that it isn’t for most people. That’s why I created the spreadsheet, so people can plug in their own numbers and clearly evaluate their situation without relying on someone else’s experience to make a decision about what is right for them. I’m not aware of a study that gives exact numbers, but we both know that a significant number of military homebuyers wish that they had never gotten involved in real estate…I’d estimate that it is more than 50%. Given the fact that nearly all real estate purchases involve borrowing large amounts of money, it is absolutely necessary that potential buyers be looking at the purchase very critically and making very conservative assumptions.